Ismail Omar Guelleh will be the first African president to appear as a witness in a UK corruption case. But this trial of intrigue is just one of many challenges facing the 16-year president. President of Djibouti, Ismail Omar Guelleh, has been in power since 1999, but how much longer can he last? Photograph by FCO. For the first time in history, a sitting African president will be summoned to give evidence in person before the British High Court. Ismail Omar Guelleh, the long-standing president of Djibouti is set to travel to London next month to testify in a long drawn-out trial involving his millionaire compatriot, former ally and now rival Abdourahman Boreh. A former presidential candidate, Boreh was accused of terrorism, saw his worldwide assets frozen and was sentenced to 15 years in prison in 2009 by a Djiboutian court. However, that decision, made in absentia, was later overturned after the British court deemed the trial politically motivated. A spectacular round two is now set to start after Justice Flaux insisted that Guelleh must give personal testimony in court and set the record straight given that the case against Boreh is based almost entirely on oral evidence. 16 years into his presidency of Djibouti, Guelleh faces the dubious honour of being the first African president to appear as a witness in a UK corruption case. But while this legal battle between two Djiboutian bigwigs and former allies looks set to heat up in the following months, the dramatic international case is not the only headache on the horizon for the president. 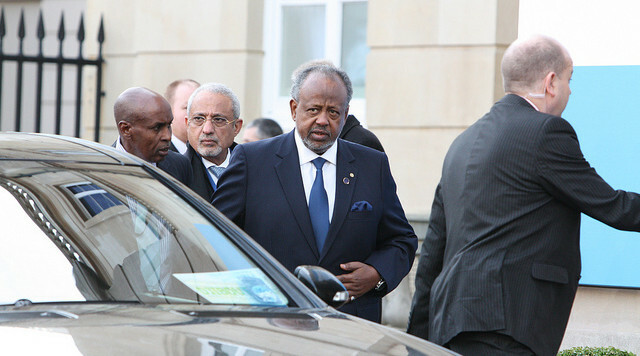 Guelleh has long been engaged in a delicate balancing act in his rule of Djibouti, and it will require the deftest of political touches for him to continue on this road. Under his watch, Djibouti has seen healthy economic growth, driven by Guelleh’s outwards-looking approach, which has helped the pin-sized East African country punch well above its weight internationally. In particular, Djibouti has benefitted from its geostrategic positioning on the Horn of Africa and plays host to several foreign armies. France and Japan each pay $30 million per year to rent out military real estate, while the US doles out $67 million for its 500-acre Camp Lemonnier, its only official permanent base on the continent. Beijing is also now looking to get in on the action with Djibouti poised to become the first in the world to host a Chinese overseas military base. Guelleh announced in May that he is in talks with Beijing to open a bricks and mortar installation in the northern Obock region, which, according to reports, will house 10,000 Chinese troops at a yearly cost of $100 million. Djibouti is also hoping to further capitalise commercially on its strategic position at the juncture of various busy international shipping routes. The country already generates significant revenues from its port and is looking to become a key East African hub – or Africa’s “Singapore” or “Dubai” in the words of Saad Omar Guelleh, the manager of the Port of Djibouti and half-brother of the president. This ambition has not been plain sailing, with a number of international companies abandoning the country in recent years due to a mixture of court cases and political difficulties. For instance, Total, Mobil and Shell have all abandoned their oil interests in recent years, with other major multinationals packing up too. However, a number of Chinese companies have become heavily involved in their wake, seeing Djibouti as a crucial node in Beijing’s ambitious and globe-trotting “One Belt, One Road” (OBOR) initiative. No fewer than 14 infrastructure projects, mostly financed with Chinese money, are now in the works in Djibouti. However, not all that glitters is gold, and an economic boom under Guelleh has been accompanied by a humanitarian bust. While the country’s GDP has doubled over the past decade and is expected to grow at more than 4% per annum going forwards, entrenched corruption and venal office holding have robbed the average Djiboutian from seeing much improvement in their standard of living. A 2014 report issued by the UN paints a bleak picture: less than half the population enjoys access to electricity, a figure that has budged by a meagre 2.4% over the past decade; hunger is widespread, with the percentage of malnourished children having grown since 2006; meanwhile, access to improved sanitation facilities slightly shrunk from 61.5% to 61.3% between 2005 and 2011. Politically-speaking, Djiboutians have also faced tumultuous times as Guelleh has tried to maintain his grip on power. The government has been accused of human rights abuses, while both Cuba and Yemen can boast having a freer press than the repressive Djibouti. One illustrative example is that of Maydaneh Abdallah Okieh, the owner of the first independent radio station in the country, who has been jailed three times in the last few years, including a six month sentence for posting photos on Facebook that showed police breaking up a protest. Guelleh has also gone to great lengths to extend his term in office. It took a controversial constitutional amendment to allow him to run for a third time in the 2011 elections, which he won in a landslide after the opposition boycotted the contest. When 6,000 people participated at a rally denouncing his cling on power with banners reading “IOG out”, riot police moved in and in the chaotic tear-gassed atmosphere, five lost their lives, dozens more were wounded, and large numbers were arrested. At the time, Guelleh promised he wouldn’t run for a fourth term when the April 2016 elections come round, but he has since refused to restate his intentions unambiguously. Meanwhile, a political agreement with the leading opposition party, the Union of National Salvation (USN), that was clinched in December 2014 after 18 gruelling months of negotiations is now at a deadlock. The agreed document outlined a roadmap to the 2016 elections and included an amnesty for opposition members, a rapid reform of the Electoral Commission, and an immediate halt to “all acts that could lead to tense situations between public authorities and opposition activists”. But the words never left the paper – a Djiboutian human rights observatory has since documented multiple instances of arbitrary arrests, illegal detentions, and kidnappings of opposition members. In better news though, the spokesperson of the USN, Daher Ahmed Farah, a widely admired soft-spoken former journalist, has finally been allowed to return to Djibouti after being illegally imprisoned some 20 times over the years. Feeling cheated by illusory promises of democratic change, FRUD, a politico-military movement, renewed a military offensive in April near Obock, in the north, drawing Djibouti’s military into the fray and raising fears of a rekindling of the country’s bloody civil war of 1993. It is against this complex background that the Boreh trial is being held. It will take place thousands of miles away in London, but its outcome could be a serious political challenges to the Guelleh regime. By using his country’s strategic position as a bargaining chip, Guelleh has managed to cobble together the international support needed to maintain his hold on power. Bringing China into the fold was a further political masterstroke, meaning that even if Western partners back out, Djibouti can still rely on Beijing’s financial and political support. But with no real talk of a political transition in sight domestically, the possibility of strong resistance and potential violence when the 2016 elections come around is rising. After all, barring a point-for-point implementation of the December accord, the opposition cannot hope to break through in the elections and bring about Djibouti’s first democratic transition in 40 years. Furthermore, with rumours that Eritrea is bankrolling the fighting in the north, post-election violence could spin out of control. As such, implementing the accord might be the lesser of two evils for the troubled Guelleh regime and could result in a semblance of stable governance. Because as it is, Djibouti’s elite may be well reach their ambitions of becoming Africa’s Dubai – but only if they are measuring the comparison in terms of a dismal human rights record and lack of democratic credentials. Malik Ibrahim is a risk analyst working on political and security issues primarily in the MENA region. He is a contributor to Middle East Monitor and Eurasia Review.